These five programs have elevated the daily news podcast to an art form. I heartily agree, which is why I don’t turn on the TV until the sun has set. But I do turn on my iPad and tune in to a podcast or seven to find out what fresh hell has been minted while I was sleeping. I’m trying very hard to become that person who gets up at 5:30 AM (okay, 6:00 AM) to put in some work on my website, and as a result, I usually manage to get through about 2 hours of news-y podcasts. I tried Morning Joe, but I find myself unable to sit through all the sports chatter. In its place, I’ve created a line-up that includes shorter podcasts of 20-30 minutes. I may hear the same story again and again, but I definitely get some interesting perspectives on it. There is a knack to the daily news program — you have to keep it fresh and exciting, but you must also follow some kind of formulaic structure so that your listeners will know what to expect. The five programs listed below do this beautifully! Great for: your morning routine, commute etc. 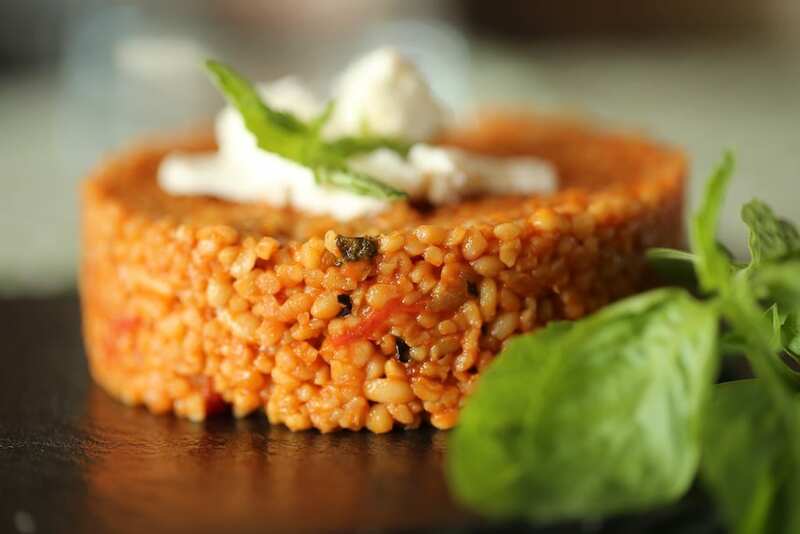 Everyone is hooked on The Daily, and it’s easy to see why. 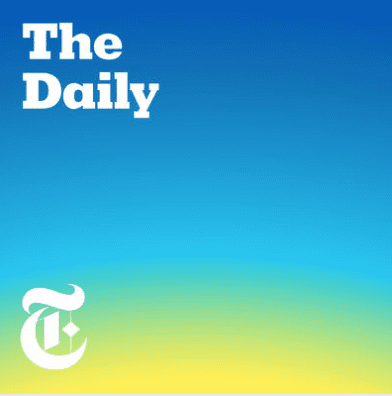 Brought to us by the flourishing New York Times, this is the gold standard of daily news podcasts: each 20+ minute episode is a deep-ish dive into just one of the stories the paper is covering. The delightful host Michael Barbaro also peels back the curtain and shows us a little bit of how the news sausage is made. Many episodes begin with Michael’s contacting a colleague who is busy covering the North Korean summit or a Supreme Court nomination. You hear not only the Skype dial-tone, but also how very sleepy Peter Baker really is. Through chatting with reporters, editors, the key players in the stories, and other sources, Michael shows us how the story developed and gives us a reasonably good roadmap to where it might go next. 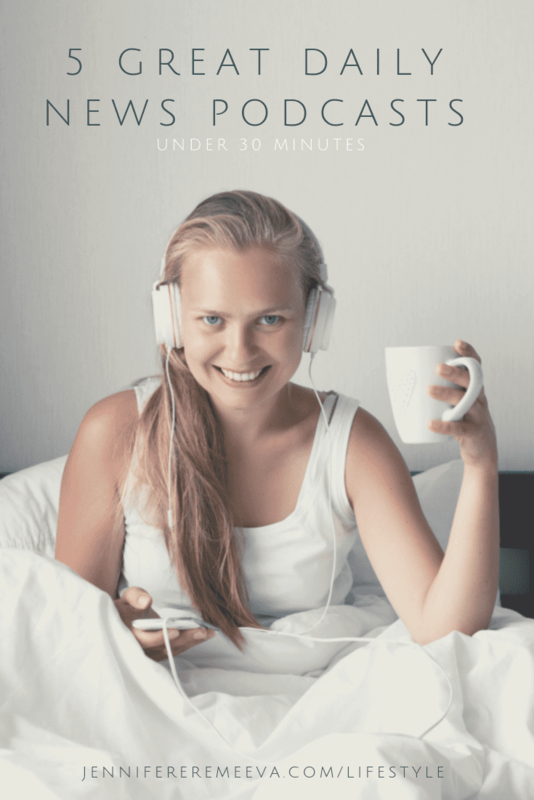 This is a lively and absorbing 20 minutes that I find essential for easing into the day — sort of the way a few minutes of yoga or a hot shower does. It’s a testimony to the popularity of the podcast that Michael Barbaro’s iconic, and really very charming “huh?” ( a vocal tic with which he conveys intrigue tempered with surprise and a little bit of disbelief) is being eagerly adopted by the twenty-something aspiring liberal elites. Heck, I’ve found myself embracing it too. So jump on the bandwagon. Really. Everyone’s doing it. News and deep dive analysis is great, but sometimes you just need the headlines without any of the fuss or the snark or even the engaging Barbar-ian “huh?” Like those moments when utterly unbelievable breaking news flashes on your phone. Before you take to Twitter, its essential to check an accurate and reliable news source. And that’s where the BBC comes in. Fast approaching its centenary, this venerable British media holding has managed to move into the podcast era with the same elegance and excellence with which it dominated the radio era for so many decades. I am an unapologetic evangelical fan of “the Beeb.” I don’t think anyone does news or television quite the way they do. They have parlayed their preeminence in radio into a marvelous range of podcasts that are a pleasure to listen to. 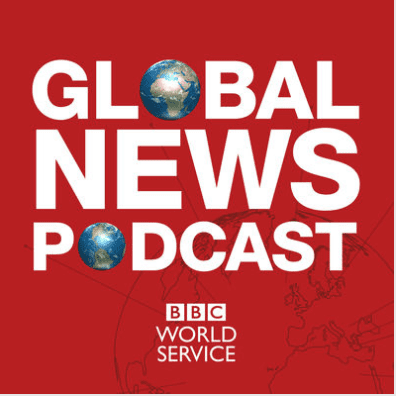 The Global News Podcast comes out twice daily and gives you the news headlines curated from the BBC’s global news bureaux. If you’ve listened to and enjoyed BBC Radio in the past, you’ll feel right at home with the podcast. This is balanced reporting, and come on, doesn’t the news just sound better in British? Of course, it does! If you find you are craving more, test drive the BBC’s hour-long news podcasts Newshour, which is my primary source of news when I’m in Europe, or the forty-five minute World at One. Balanced news and analysis of the top stories the BBC is covering around the world. This podcast keeps you up to date and in the know not only about what’s going on at home, but also what’s going on in other’s people’s homes. I sometimes get the two daily podcasts confused and listen to one twice. It’s testimony to the excellence of the program that I haven’t got completely frustrated. Start listening to the most recent installment. I’ve got mixed feelings about Vox, which at times can seem almost as biased as the American conservative networks (mind you, I know which team I’m on). But it cannot be denied that the intellectual titans that are Ezra Klien, Melissa Bell, and Matthew Yglesias have created a team of unusually gifted and dedicated journalists who check their facts and craft excellent thought pieces, informative video shorts, and now a range of excellent podcasts. If The Daily and Up First get me up and out the door, I’m increasingly relying on Today, Explained to get me through the afternoon. Hosted by Radiolab veteran Sean Rameswaram, the show pauses for a moment, just as you might for an afternoon cup of tea, to consider some of the stories that are enjoying buzz that particular day but also some that are lingering and developing, or those that doggedly refuse to go away. 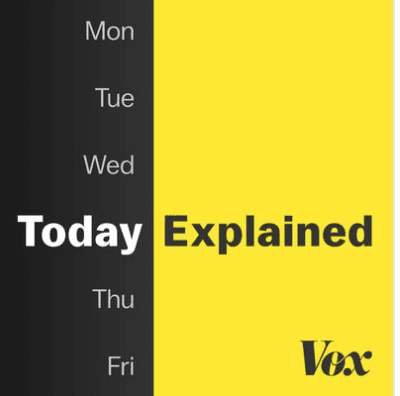 It is a testimony to Vox’s staff that they manage to juggle the constant rush and torrent that is the current news cycle while still managing to create great programming and book such exceptional guests such as David Fahrenthold of the Washington Post and host of Slate’s Amicus, the estimable Dahlia Lithwick. I’ve come to Today, Explained recently, but it has quickly become the jolt of energy I need to get me to the afternoon’s finish line. This is smart reporting and analysis. I always come away feeling more informed and enlightened. Edgy, on topic, unapologetic, unvarnished news and intelligent analysis. Great guests and very good discussions about the stories that are making headlines. This is not an unbiased look at the news, and I often have to remind myself that the current administration will probably not collapse that evening, despite gleeful predictions from the show’s guests that this is imminent. The guests and host have also been known to occasionally use explicit language, which does not bother me, but might be a concern if you have small children around when you listen. There are also a ton of Quip toothbrush and Casper mattrass promos, which is par for the course these days, but Vox seems to have a ton. Let me use a culinary analogy: Up First is what you would get if you trimmed all the fat from NPR’s Morning Edition, trussed it, and served it up, already sliced, on a bed of watercress at room temperature. No extras, just the real thing, distilled down to its essence. Anchored in what has to be the middle of the night by NPR hosts Rachel Martin, David Greene, and Steve Inskeep, Up First gives you an efficient but effective look at the major news stories NPR is hovering around the world, checking in with the global superstars of Public Radio for commentary and analysis. They also provide a quick snapshot of the what will be in their focus throughout the day. This is a classic 20-30 minute podcast that packs a lot in, yet never seems rushed, serving up the essentials you need to get going informed and enlightened. 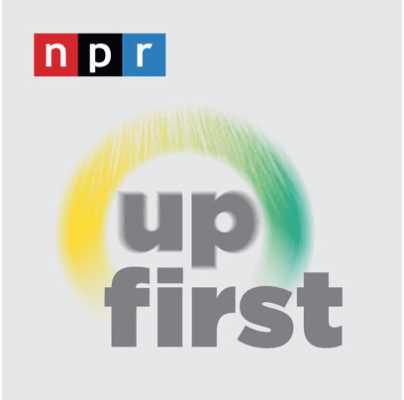 On those days when you need to achieve greatness and don’t have the time to linger over a 2-hour morning news show, Up First helps you get where you are going. I honestly can’t think of anything. This is NPR at its best. Download and begin listening each day. Are Angela Merkel’s centre-left coalition partners getting itchy feet about the alliance? Was Leonardo Da Vinci’s masterpiece “Salvator Mundi” painted by somebody else? London-based Monocle Radio offers a refreshingly non-American daily view of the news stories making headlines around the world. 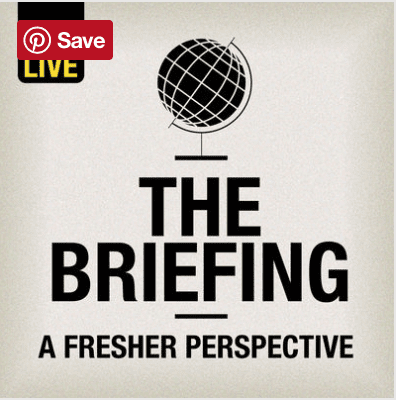 The Briefing is just one of the excellent programs from this London-based media brand, which runs a radio station and a publishing house. It’s a delightful rabbit hole to fall into, and I’ll be critiquing some of their other programs down the road. When my Russian-born husband grew tired of the American-dominated news, I turned him on to The Briefing, which is now his weekday go-to listen to get a quick 30-minute blast of international news tempered with a good balance of politics, culture, business, technology, and science. The pace is brisk, the interviewers engaging and energetic and the format is a mix of live reporting, interviews, and analysis. If you are American, this is a great way to find out what’s going on in the rest of the world. It’s keen intelligence, distilled into an enjoyable and informative 30 minutes. For those not used to a trendy metro-British accent, there may be something of a learning curve.